Your vet probably said your dog was overweight. Or fat. Or even obese. Carrying around extra weight isn’t cute, it can shorten your dog’s life by a lot of years. As a house call vet, I see my fair share of dogs whom I am putting to sleep simply because they are too fat to move. This would be completely avoidable if the owners would have taken serious steps to help their dog years ago. Instead, I see a miserable dog whose old, weak, arthritic legs simply cannot support all that extra weight. Honestly, it’s heartbreaking – and preventable. How to help your dog lose weight? First, rule out any health problems your dog might have (everybody wants the thyroid checked). This article focuses on food, but we need to remember exercise is just as important! A fenced yard does not count for exercise – here’s my article on walking your dog. If you’ve never walked, start with 5 minutes twice a day, and follow your dog’s cues. Does he want to keep going? Is he over it? Make it fun! Talk to your veterinarian about how much exercise and what type might be best for your dog. Doesn’t want to exercise? Maybe he’s painful! Your vet can initiate pain medications to help get your dog moving for the weight to come off. And while exercise is important, I’ve found many dogs are grossly over-fed – that’s what we address here. Your dog can lose weight AND still get treats! Table food is not always bad! No, I’m not saying feed all the treats you want, and feed whatever you want from the table, but hear me out. I’m going to walk you through how to get your dog down to a healthy weight without feeling like a horrible pet parent. Your routine won’t be turned upside down! There’s no secret, no magic, just science that works. And warning- there’s math involved! First, like with any problem, we have to know the facts in order to create a plan. We need to know what you feed your dog. Scratch that, let’s say we need to know everything that goes into your dog’s mouth, and how. We’ll start with the dog food bowl. Do you feed set meals twice a day? Is the food bowl down all the time? Do multiple dogs share one bowl? The next question – how much do you feed? Answer this question out loud. Now try answering it while sitting on your hands, and without saying the words “only” or “just.” Not easy, is it? Do we really know how much we feed? That cup or scooper you use, how big is it really? One cup might not be a true, 8oz cup! I had an owner swear his dog ate 2 cups of food a day. Being a house call vet, I have the unique advantage of seeing the bowl, and the scooper. When I got my 8 oz measuring cup out, I measured the food in his bowl to be TWELVE cups! Was he intentionally lying? Of course not! We have no way of knowing these things until we measure them. With an actual measuring cup. For reals. Next, we need to know how many treats and snacks we get. No guilt here, no condemnation. We are simply collecting data. It might be helpful to keep a journal. If each member of the family is involved, have them each keep a journal covering what they feed the dog over the course of a few days. Each treat, which type, how many french fries, with or without ketchup (just checking)…write it all down. So once we have a list of everything our dog eats, is it time to say “cut out the treats”? Nope! We get to use math instead! (OK, so some of you just said “forget that, I’ll just cut the treats”). Yes, math is our friend here. It used to be there was no calorie content listed on pet foods. Drove me crazy. To find calories, I’d have to call the company and PROVE I was a veterinarian…like calorie content was some kind of nuclear secret! Thankfully, recent changes in laws or whatever require a calorie content to be reported on all pet foods. So now YOU can do this. Using the printed calorie count on the packaging, and a calculator, you can figure out how many calories a day your dog is eating. How do you allow for the table food? We’ll have to ballpark that, but a quick internet search of “how many calories in…” should answer your questions easily. So don’t leave it out just because there isn’t a package to read. So you’ve done the math, and estimated about how many calories your dog is eating. Now what? We next figure out how many calories your dog SHOULD be eating! It starts with knowing our dog’s current weight. In the US, most dogs are weighed in pounds. For these calculations, we have to catch up with the rest of the world and use the metric system. 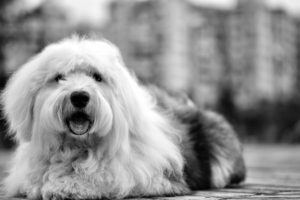 So we need to convert your dog’s weight into kilograms – easy! Take his weight in pounds, divide by 2.2, and that’s his weight in kg. Write that number down. Knowing this, there are two formulas to use. The red is for the smarty pants among you (and more exact) and the blue is for those without access to a scientific calculator, or just don’t want to think too hard. calories needed per day = 30 x (weight in kg) to the 3/4 power. Yep, you’ll need a square root button on your calculator. With that number, hit square root. Now hit square root again. Multiply that number x 70. That is how many calories a day your dog needs to maintain his current weight. Maggie weighs 44 pounds, which is 20 kg. So 44 lb Maggie needs to eat about 662 calories a day to stay 44 lbs. These two formulas work interchangeably for dogs less than about 80 lbs. For the big dogs, the first, red, more complicated formula, will be more accurate. Either way, you now have an idea of how many calories your dog needs to maintain her current weight. But we don’t want her staying at this weight, so we’ll need less calories. Take the number of calories you just calculated your dog needs to maintain that weight, and multiply by 0.8. (we’re reducing the calories by 20% this way). So about 530 calories a day would be a goal for Maggie to start losing weight. How does that compare to how many calories you worked so hard to calculate she’s been consuming? 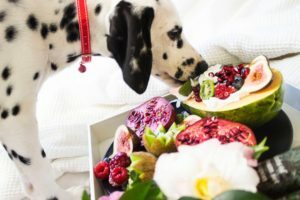 If you’ve (reasonably) accurately figured all the food that goes into your dog’s mouth, and the calories she’s actually eating are way lower than what you calculated his body needs, two possibilities. First recheck the math, interrogate the kids, find out what the dog is really eating. Or, it could simply be your dog may have a lower than normal metabolism (that does happen!). Might be worth talking to your vet (maybe check the thyroid?). Conversely, if your dog’s calorie requirements are waaay less than than what he has been eating, we’ll have to cut back more slowly and gradually. Either way, we are doing this (and still getting over the fact we actually used square root in every day life!). Depending on the difference between what she’s actually eating and how many calories she needs, there may be a big adjustment to go down to the amount of calories she needs in a day. We want to reduce the calories gradually. For example, say our example Maggie needs 530 calories a day, and you’ve been feeding her 900. Going from 900 to 530 is a pretty dramatic drop. Start by reducing from 900 to 750 for a couple weeks, maybe a month, see how things go. Then go from 750 to 650. After a couple weeks go from 650 to 530. We don’t want a dog who feels she’s starving, so we need to let her body adjust. The beauty of this is – we know how many calories we’re shooting for, and we can tailor it to still work with your dog’s lifestyle. Allow for treats in that calculation by decreasing the food. We have to do this within reason. For example, if a person needs 2,000 calories a day, you want the majority to come from healthy things, and not get your day’s worth of calories from chocolate (although most days I do!). Similarly, our pets need to have at least 75% of our calories come from a balanced dog food, and the rest is wiggle room for treats. I have many owners who use the dog food as treats – it is all in the presentation, after all! Big Max can get 500 calories a day. The dog food he’s been eating has 400 calories per cup, so we’ll feed 1 cup a day. Ideally, we’d feed two meals a day, no dogs sharing, each dog gets his own bowl. So we’ll feed Big Max 1/2 cup twice a day. We have 100 calories in wiggle room for treats, and his favorite biscuits are 30 calories a piece. Big Max is used to getting 10 treats a day, so this is not going to work! (That puts him at 700 calories a day – probably how we got ourselves into this mess). But he’s used to getting treats! He also likes to lick his dad’s oatmeal bowl when he’s done. His mom also makes him a plate of pancakes on the weekend. He gets a dental chew twice a week. How can we help him lose weight and not rock his world? Though healthy for humans, many fruits can be high in calorie, or contain seeds. The first step is to revisit the treats. Thankfully, there are many good treats out there that are small, and 3-5 calories a treat! And licking the oatmeal bowl is OK (assuming his dad eats the majority of it). What about the pancakes? Many treats we give are more about the act, the ritual, the routine, and less about the food. So when Big Max is awaiting his pancakes every Sunday, telling him “no” is going to be stressful and confusing. He can get the same plate, but half of one pancake, cut into pieces, so he feels special, but isn’t getting all the calories. Of course, he’ll totally know something’s up, (Big Max wasn’t born yesterday) but it won’t be as bad as stopping the routine all together. Finally, dental health is important, and I never want to eliminate dental chews altogether. That said, check the calories on the chew, and consider shopping for a lower calorie version. We have to consider those calories in our daily total as well, so the days Big Max gets his 80 calorie dental chew, the treats are limited to carrots and ice chips. We also need to revisit the dog food. 400 calories a cup is rather high for dog food. Changing to a lower calorie food would allow Big Max to eat more, which might make him happier and feel less hungry. These are just a few of the healthy foods my patients enjoy. But if your dog is turning up his nose at the fruits and veggies (and those ice chips aren’t fooling anyone!) we can try…breakfast cereal! Think about how many calories are in a single Cheerio – maybe 2? Chex cereal? Kix? They are small, easy to handle, and low in calorie. Of course, we are avoiding the super sugary cereals. So you’ve found a low calorie treat or (healthy) human food he likes, but your dog is very used to begging from the table and getting whatever you eat. For this weight loss plan to work, we need a change. This is where it’s all about presentation. I suggest keeping the day’s allotted amount of treats, cereal, veggies, what-have-you on the table with you. While you eat your food, hand your dog his treat (or a piece of his dog food if he’s one of those who falls for it). Sometimes a little acting has to be involved, but if you pass it off like it’s no biggy, he shouldn’t suspect much. I know this is a lot to take in, but once you get a system you’ll discover it’s not so bad! After the first month, if your dog hasn’t lost weight, time to cut the daily calories by 20% (and refigure the amounts of food, treats, etc). Still no weight loss after a month? Try cutting another 20%. And talk to your veterinarian. While calories are a big part of weight control, it isn’t the whole picture. You might need to change dog foods to adjust the ratio of fat/carbs/protein to help your dog’s metabolism. We might consider some prescription pain medication to make exercise more comfortable if your dog has any under-the-radar arthritis. And every dog is different, just like people. Some have great metabolisms lose weight easily, some don’t, so be patient – it will happen eventually! Posted in General health, Weight Management. ← Vaccines do NOT keep your pet healthy!